Taking a rest day from running yesterday due to my quad gave me plenty of time to reflect on how far I’ve come as a runner since last year. A lot of days I feel like I am the exact same runner I used to be. But looking through my Garmin Connect data I see that I have made some pretty decent strides over the last year. My pace just doesn’t feel important to share. I’d much rather talk about marathon training, running ultras or my cat! I think maybe the last time I wrote about my pace was in February when I ran a 5K. Adam and I showed up late. It wasn’t a PR day. I ran at an average pace of 12:49. Today I want to share a comparison (that surprised me) of where I was at last summer vs. this summer. I have to use comparative numbers from May 2013 / May 2014 because I apparently did almost all of my runs on the treadmill last June, July and August and as such they aren’t logged in Garmin Connect to easily compare against this year. As you can see, some days I didn’t even make it a full mile and my paces were wildly inconsistent (and included A LOT of walking). Seeing these numbers really surprised me because I started half marathon training last summer, and I thought I was running much longer and faster at the beginning of the summer. I guess I didn’t really start training for my half until July 2013. My average pace during half marathon training was an inconsistent 14:30-16 minute mile so it came down a bit from the chart above simply from working with a coach who helped me correct the inefficient things I was doing. I looked through my old posts to see what I was thinking back when I was running the numbers listed in the chart above. When I started working with Coach Joy back in June 2013 I was doing 2 minute jog / 1 minute walk intervals. She moved me up to 3 minute jog / 30 second walk intervals and that’s why one and two miles suddenly felt really hard. I did note that even though the new run/walk intervals were much harder I felt like I was making progress. In May 2013 I cut a 4-miler short and it took me 1hr 6mins. 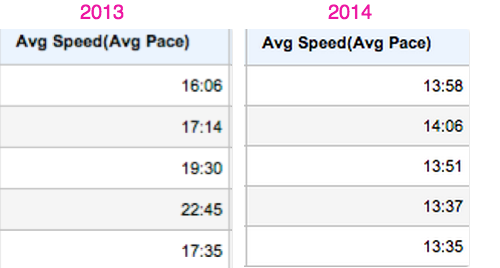 In May 2014 I was running easy 4-milers in the 55 minute range and my paces were obviously a lot more consistent. (I had stopped using run/walk intervals for a while during the winter on runs under 5 miles, but towards the end of April I started including them again because the heat/humidity was just killing me so these numbers reflect my paces with walk intervals in them). Before I looked up these paces I honestly thought my numbers this summer were pretty similar to my numbers last summer. I guess it’s hard to judge my own progress by feel since everything happens gradually. I still have a long way to go before I reach my pacing (and distance) goals, but I’m excited to see what happens when the weather cools off. I don’t think I’ll ever be a run blogger who posts her paces every day, but I do think I’m going to start writing a monthly recap that includes my overall pace for the month. I think that will help me keep track of my own progress better, and stop me from sometimes feeling down on myself when I feel like I’m not improving. It will also motivate me to try harder! If I could shave off 11 minutes from my 4-mile pace again next year I’ll be in a pretty good spot : ) Although I really can’t imagine that will happen again. I think that big jump came simply from having the confidence to say to myself, I CAN run, I don’t need to walk so much! I can do this! When I started training for a 5K in 2012 I really didn’t take it seriously at all. In 2013 when I started training for my first half marathon I took it very seriously, but only when it came to distance. I didn’t do anything related to speed and I was happy just to finish. When it comes to the marathon I have coming up in October I’ll be happy just to finish, but this will be the last race I run where my only goal is to make it to the end. I want to work hard this winter to improve my paces so that I can have time related goals at future races. I feel like I was decently dedicated to my speedwork this summer. I know there were some nights when I could have pushed harder, but I let the heat get the best of me. This winter when the weather is a brutally cold 80 degrees (hah) I want to really take advantage of it and work hard. Next year around this time I want to feel like a more complete runner… as in one who takes both distance and speed seriously. I don’t need to run 50-miles at an 8 minute pace (not that I will ever be able to do that anyway), but I do want to run whatever distance I’m faced with at a pace that I feel confident about. Next Post Happy Friday! Happy UTMB Day! Have you ever run a mile as hard as you can? I hate doing it, but I do find that doing that every month or so provides me with a god basis for where my pace is. It seems (and this is perfectly fine!) that you rely a lot on the walking intervals. Maybe trying once a month to run a mile without stopping and going as fast as you can would give you the confidence you need to get over that? But I totally understand how terrible heat can be and I live nowhere close to Florida! I used to do that! Before I started training for a half marathon I would sometimes run a mile as hard as I could which is how I got in my first 11-minute and 10-minute mile but those wiped me out. Plus I did them on the treadmill where I could control the pace and I was never really able to re-create that outdoors. The fastest mile I’ve run outside is like 11:20-something. Last year during the colder months I cut out the walking intervals on runs shorter than 5-miles for a period and my pace did decrease down into the 12s. And sometimes I still it during speedwork sometimes so that I can get down into the 12s. I most definitely rely on walking intervals most nights, and it’s a hard habit to break! Hell yeah!! Progress, dedication, and honesty….all why I come here. Don’t care what the number is, the goal is to challenge ourselves and work towards the big picture. Hope the leg is feeling better and can’t wait to get back to training. We are all our own biggest critic, it’s tough. PS: You haven’t blogged in forever!! I am one of those who posts paces and stuff on my blog (which I think the majority of running bloggers do). Honestly, there have been times that I’ve contemplated taking down my paces and times, because I still really struggle with competitiveness and comparing myself to others, and I know that posting my times only enables that. No matter where I am, there will always be people faster than me, a lot faster than me, and slower than me. But I still keep my speed info up, for the same reason I put it there in the first place: I think it’s important to be proud of what I’ve accomplished and see the progress I’m making. I think it’s great that you’re setting new goals and challenges for yourself! When I first started running last summer I did not care at all about paces. Because just getting through 2 miles was something I could barely do, so that alone was an accomplishment – I was nowhere near ready to focus on speed! But as I started to get stronger, and run my first races, it showed me that I have potential and am capable of some great things if I really try. And thus began my journey to get fast! That’s why I want to get faster – because I know I can be even better and I want to put in the hard work to make it happen. There are some people who will never care about being faster – and that is perfectly okay (I envy them sometimes) – but for me, running is a journey, so I don’t want to stay in the same spot forever. We are totally on the same page, Hanna! I’m so glad I found your blog and that we’re training for a marathon at the same time. Even though I’ll be finishing my marathon way slower than you, I feel like we’ve been on the same training journey together! I love that you post your paces. It’s always motivating for me to see how fast other runners are going. I just generally don’t post my paces because I don’t think they are very motivating for anyone! We all run our own race. Every runner has struggles regardless to pace. We all have our own journey. I read your blog because it is informative, you are very real and honest with your training, you are a dedicated runner on a journey trying to accomplish similar race goals, we share an interest in ultras, and Cecil is cute! I publish my paces, because they relate to my long term goal of BQ, they keep me transparent in my training, it helps me set goals (a major difficulty of mine–I tend to underachieve). I love that you started to blog and share your paces and experiences. I feel like I’m really able to follow along with your BQ journey because of it! Thanks, Cheryl! Don’t fall into the trap of focusing too much on speed and getting down on yourself. I fell into that trap and my love for running faded for quite a while. You are amazing! Keep on keeping on! Thank you so much Ashley! I don’t think I’ll ever become obsessed with my paces because my biggest goal of all is related to running ultras, but I think actually caring about my paces will help make me a more well rounded runner if that makes sense! It’s all about progress! And sometimes we need to look at the big picture like you did, to really notice the progress. Each day there will be fluctuations but what counts is that over time you are making gains, and that’s awesome! Dang – you have come a long way in a short time!!! You are a complete runner – you are focused on what you need most for your marathon goal (finish!!). Plenty of time for speed work later if you want to add that in. And, I love seeing your paces. I usually put my times on the majority of my runs when I share my recaps – I always wonder if I should leave them off though. I love that you share your paces, Kim! I think you’re a speedy runner and it’s motivating for me to see them! I just don’t think my paces are motivating anyone or add anything, which is why I usually don’t share them :). You have really come a long way, Kristina, and I just love your running spirit and mentality. Pace has its pros and cons. When I first started running, I had no interest in tracking my pace. I just wanted to run and finish my races with a smile on my face. As I continued running over the years, pace became more important to me as it was a measure of my work and improvement. However, my pace does not define me as a runner. I run first and foremost because it is my happy place and stress relief. It is was always about a number I don’t think I would find the enjoyment I do in just running to run. It’s so inspiring how far you’ve come. You’ve made so much progress without really putting in a ton of speed work etc. I love that you want to focus on speed after the marathon. I bet you’ll surprise yourself! I love this! You’re making great progress! Also, keep in mind the weather for the Portland marathon should be amazing (it was perfect last year), so just that will make race day that much easier. Whether you post on the blog or not, tracking your pace and looking at it is super important. I wish I had written down what I was doing at the very beginning. Fortunately the same summer I did the Couch to 5k program with a couple friends, we sometimes ran at the gym, too, so I have distinct memories of setting some (now, super slow) paces on the treadmill, and of challenging each other to make it a whole 2 miles before we quit for the day! Even though I’m frustrated right now and feel like I’ve totally plateaued in some ways, looking back at where I started is hlepful. Your progress is impressive! Pace doesn’t matter as long as you are moving 🙂 I used to worry about my pace when I first started running. I used to see it as a way to check progress, then I realized how many other factors contribute to a “good run” or “bad run” and started to let go of that. I did get a speed bug last year and trained and met my 10K goal but after I did it it was like a weight was lifted -I realized I don’t care so much now. I just want run and feel good. Shoot, at this point I just want to be back to running outside, I really have spent most of the summer inside. Running outside has been rather discouraging I jeep trying to hang on thinking the humidity will break soon and hopefully I will feel better!